Living a Fit and Full Life: Go on a Dinosaur Adventure with Atlas of Dinosaur Adventures: Step Into a Prehistoric World! Go on a Dinosaur Adventure with Atlas of Dinosaur Adventures: Step Into a Prehistoric World! From the team behind the best-selling Atlas of Adventures comes this prehistoric journey of discovery. You’ll get to embark on over thirty dinosaur adventures that will take you all around the world! Travel back in time to lock horns with a triceratops, stalk prey with a T-Rex, and learn to fly with a baby Pteranodon. With hundreds of things to spot and facts to learn, this is the biggest Atlas adventure yet! Go on a dinosaur adventure with Atlas of Dinosaur Adventures: Step Into a Prehistoric World! 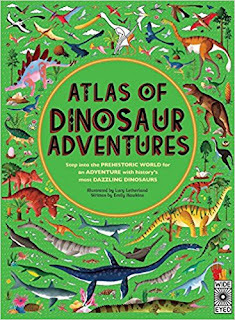 Atlas of Dinosaur Adventures: Step Into a Prehistoric World is a fantastic book for kids, especially kids that love dinosaurs. It's filled with many different dinosaurs and will surely keep kids busy studying the different dinosaurs. There's hundreds of things to spot and tons of fun facts to learn. My kids absolutely love this book and even though we've had it a couple of weeks now they haven't tired of it in the least. 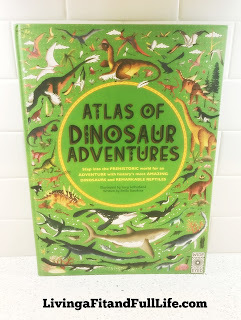 Atlas of Dinosaur Adventures: Step Into a Prehistoric World is the perfect book for kids interested in dinosaurs and will surely take them on a fun adventure! You can find Atlas of Dinosaur Adventures: Step Into a Prehistoric World by Emily Hawkins on Amazon, Barnes and Noble and other bookstores.